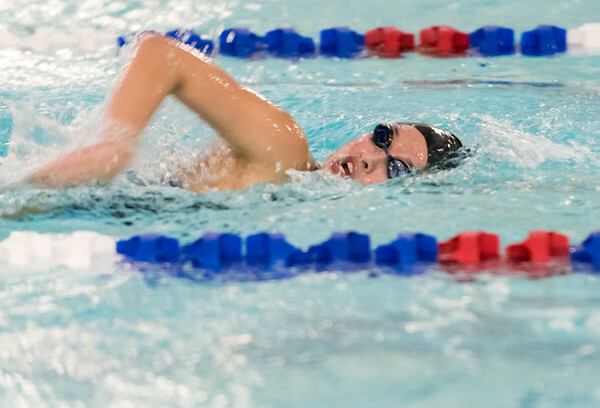 PLAINVILLE - It was quite the day for the Plainville girls swim team. Not only did the Blue Devils pick up their first win of the season Tuesday afternoon, but it was the first time they beat E.O. Smith since Chris Zagorski took over the program six years ago. Julia Smith took the deciding event, winning the 100 breaststroke with a time of 1:30.23. Morgan Rogers and Lydia Weinberg were both double winners for the Blue Devils. Rogers also qualified for the Class S state meet in the 200 I.M. with a time of 2:26.86 as well as the 100 backstroke with a time of 1:03.23. Weinberg qualified for states in the 50 freestyle with a time of 27.32 and the 100 freestyle with a time of 59.80. Phoebe Gebiman took first place in the 500 freestyle with a time of 6:30. Hall 3, Southington 0: It was a much closer match than the final score indicated. Evan Jones and Drew Seguro scored the first and third goals for Hall. Southington keeper John Griffin finished with 10 saves. Berlin 7, Maloney 0: Ashley Wenzel has been making a statement as of late for the Berlin girls soccer team. In just two games the sophomore has scored a total of seven goals, including a hat trick during the shutout over Maloney. Three other Redcoats were able to find the back of the net on Tuesday including Maxine Muscatello, Carly Grega and Erica Lavoie. Lindsay Walsh also recorded one save on the evening. Berlin is now 2-0 on the season and will host Glastonbury on Thursday at 3:45 p.m.
Southington 1, Hall 0: Abby Sowa made the lone goal for the Blue Knights Tuesday evening. Southington had a total of 14 shots on goal, while goalkeeper Olivia Sherwood recorded four saves. The Warriors had two shots on goal and their keeper saved two. Southington will travel to Maloney on Thursday. Plainville 18, East Hartford 43; Plainville 15, New Britain 50; East Hartford 15, New Britain 50: It was about as good as a first meet as the Blue Devils could have hoped for. Cole McNamera and twin brother Connor took first and second place overall respectively with an 18:34 and 18:40. Teammate Brody Davidson took fourth with a time of 20:45. Matt Melluzzo was the top runner for the Hurricanes with a time of 20:35. Plainville 20, East Hartford 37; Plainville 15, New Britain 50: Like their counterparts, the Blue Devils girls team had few issues coming away with the sweep. Kaycee Newberry (25:43) and Emma Lopez (26:06) were Plainville’s top two runners. Posted in New Britain Herald, Berlin, New Britain, Plainville, Southington Herald on Tuesday, 11 September 2018 21:10. Updated: Tuesday, 11 September 2018 21:13.